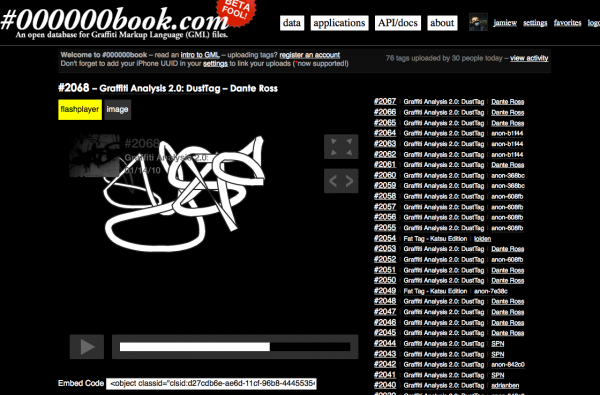 000000book.com (“Blackbook”) is a new website for archiving and sharing motion-captured graffiti tags. Tags are saved as Graffiti Markup Language (GML) files, which can be created with freely available software like Graffiti Analysis, Laser Tag, and with our two new iPhone apps, DustTag and FatTag Deluxe: Katsu Edition. Anyone can easily upload GML to #000000book through our open API, and the aforementioned iPhone apps have 000000book.com upload built-in — download the app, start tagging, tap ‘upload’, and see your work immediately featured on the frontpage. Interested in working with GML? We’re coordinating via #fatlab IRC and a newly created GML mailing list. We’d like to thank everyone that participated, published and put up with our week of Kanye Webst. We know there are more important issues going on the world so thanks for indulging with us in seven days of hip-hop, caps lock, source code and popular culture. The week produced 12 new projects, 5 sets of source code, 81 comments and 27 user uploaded images. Some of our projects were frontpaged on Digg, Gizmodo, Gawker, PSFK, todayandtomorrow.net, BuzzFeed, Rhizome, urlesque, A-Trak’s blog, Village Voice, National Post, and ANIMAL among many others (thanks for the love). Pretty much everyone but the man himself, which leaves us asking only one question… WHERE ARE YOU YEEZY?!??!??!! FOR REAL, CAN WE GET SOME BLOG LOVE?!??!??!??!?!? !